I'm a firm believer that a person's name is important. We put a lot of thought into our four children's names. We went through baby books and picked out top choices and then tried them out loud, wrote them on paper and made sure their three initials didn't form an embarrassing word or anything like that. We test drove every possible nickname to make sure they wouldn't one day reach a certain age and demand to know what on earth had possessed to name them what we did. Their names are fairly unique. And mostly, I'd say that's a good thing. However, we have spent a fair amount of time spelling our children's names or correcting pronunciations. Undoubtedly, we have had to do this the most for our third child (and oldest son), Declan. I first heard it when I lived in Belgium for a year after college. One of the t.v. programs they showed over there called Heartbreak High, was imported from Australia -- their version of 90210. Crazy high school drama aside, one of the main characters was named Declan, (whose family was from Ireland) and I fell in love with how the name sounded. You get the picture. His name is pretty unique and rare. So you can imagine our surprise a few days ago when we were at some friends' pumpkin carving party and I called out to Declan to come and get his food. The little boy standing in line behind me looked really confused and I could feel him staring at me and nudging his mother. 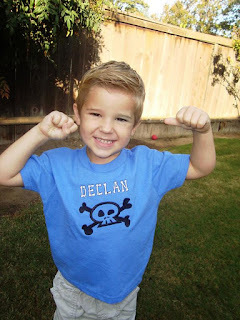 After I called out to Declan again, I heard the little boy whisper, "Mom! Someone else is named Declan!!" As my Declan ran up, I introduced him to the other little boy and they had a fun time smiling at each other talking about their names. The other Declan's mother and I talked about how rare it was for us to hear of another child with same name and equally rare it is to find one at the same social event. I don't have the same problem. Stores abound with "Heather" items. And, while I adore my parents and I actually like my name (it means flower), Heather is not the most unique name for a girl born in the 70s. I have frequently been in a community setting with multiple Heather's -- thereby earning the moniker of "Heather 1" or "Heather 2," etc. That's not so fun. After awhile, you start to wish for something a little less...common. If I thought having a fairly common name didn't make me feel too special from time to time, can you imagine having a name that means something terrible? How about having a name that literally means, "Unwanted." Yep...you read that right. As in "I didn't want you," or "you weren't wanted," or "we wanted a boy, not you!" According to the news story, "more than 200 Indian girls whose names mean "unwanted" in Hindi chose new names for a fresh start in life" at a recent "renaming ceremony" with the intent of giving "the girls new dignity and help fight widespread gender discrimination that gives India a skewed gender ratio, with far more boys than girls." "In shedding names like "Nakusa" or "Nakushi," which mean "unwanted" in Hindi, some girls chose to name themselves after Bollywood stars like "Aishwarya" or Hindu goddesses like "Savitri." Some just wanted traditional names with happier meanings, such as "Vaishali" or "prosperous, beautiful and good." "Now in school, my classmates and friends will be calling me this new name, and that makes me very happy," said a 15-year-old girl who had been named Nakusa by a grandfather disappointed by her birth. She chose the new name "Ashmita," which means "very tough" or "rock hard" in Hindi. "Nakusa is a very negative name as far as female discrimination is concerned," said Satara district health officer Dr. Bhagwan Pawar, who came up with the idea for the renaming ceremony. Activists say the name "unwanted," which is widely given to girls across India, gives them the feeling they are worthless and a burden. "When the child thinks about it, you know, 'My mom, my dad, and all my relatives and society call me unwanted,' she will feel very bad and depressed," said Sudha Kankaria of the organization Save the Girl Child. But giving these girls new names is only the beginning, she said." If you are like me, you cannot help but to be moved by such a sad (but inspiring) story. I cannot imagine having the life-long indignity of basically telling people that I was unwanted every time they asked for my name. I love the fact that someone took it upon themselves to stand up and do something to change these girls' very identities (and maybe even their destinies). Ultimately that person knew that these beautiful, valuable little girls were so much more than a name...a mere label that was carelessly and cruelly applied. Whether you love your name or hate it. Whether your parents agonized for months about if you would be Jennifer or Jessica. Even if your parents didn't chose a name for you and it was chosen for you by child welfare worker. God wanted you....and He wants you still. He knew your name before you were ever conceived. And that name is different than the one you sign on legal documents and answer the phone to. It goes beyond that to a deep place in your soul. I truly believe that when we see Him in heaven one day, He will call us by that name, and it will be as familiar to us as our own spirit. So for now, use your given name (and really...if you absolutely don't like it, you can pay a small fee and have it changed legally! ), but know that one day....someday...you will embrace a Father who gasped in delight the second you were born, who has planned each one of your days and madly, desperately, deeply loves you. 'Tis the Season...to be Grateful!